Its auto-sensing capability allows high packet transfer up to 54Mbps for maximum throughput, or dynamic range shifting to lower speeds due to distance or operating limitations in an environment with a lot of electromagnetic interference. 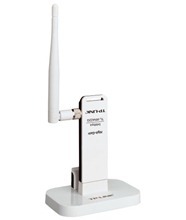 It can also interoperate with all the 11Mbps wireless (802.11b) products. Your wireless communications are protected by up to 256-bit encryption, so your data stays secure.Additionally, TL-WN422G supports PSP connection, brings you joyful online-gaming experience.